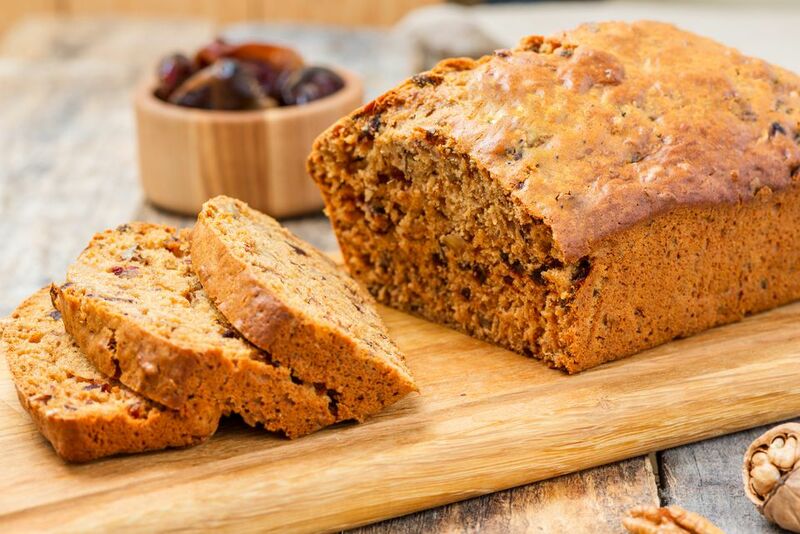 This moist date nut bread makes a wonderful breakfast or brunch bread. The bread may be made with chopped walnuts or pecans. This bread freezes well, too. Try spreading cream cheese between two thin slices and freeze the "sandwiches" to enjoy later. Or spread the bread with orange cream cheese (see variations) or an orange-flavored butter. Grease a 9-by-5-by-3-inch loaf pan. Pour the boiling water over the chopped dates in a medium bowl; add the butter and set aside. With a mixer, beat sugars and egg until light. Add to the sugar mixture, alternating with the date and water mixture. Bake in the preheated oven for 45 to 55 minutes, or until a wooden pick inserted in center comes out clean. For more quick breads, see this list of our favorite quick breads, including pineapple, zucchini, pumpkin, and apple breads. Make an easy cream cheese spread to complement the date bread. In a mixing bowl, beat 4 ounces of softened cream cheese with 1 1/2 teaspoons of finely grated orange zest, 3 tablespoons of confectioners' sugar, and a few drops of vanilla. Instead of walnuts, use chopped pecans in the recipe. Sprinkle the quick bread batter with a cinnamon-sugar blend just before it goes into the oven.